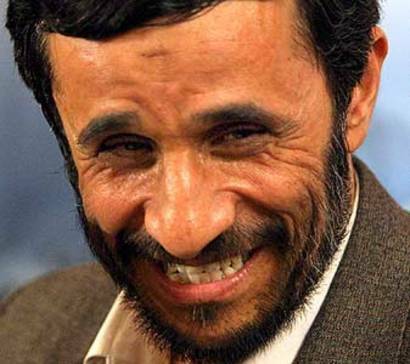 US officials stayed in their seats for Jew hater Mahmoud Ahmadinejad's UN speech. Canadians took the moral high ground and walked out. Canadian diplomats at the United Nations have boycotted a speech by the president of Iran, a spokeswoman for Foreign Affairs Minister Lawrence Cannon said Tuesday. Western diplomats, including those from Canada, have in recent years made a show of walking out on Mahmoud Ahmadinejad whenever he addresses the UN General Assembly. Catherine Loubier, spokeswoman for Cannon, says the boycott was intended as a protest against Iran’s human rights record and controversial nuclear program. I am sure Obama's representatives enjoyed hearing the US accused of being Iraq's occupiers and allowing hundreds to be killed in cold blood. Perhaps Obama will arrange a meeting between the Canadians and the Iranians over a beer. That should solve everything. Oh wait, Muslims don't drink alcoholic beverages. Perhaps some nice goat milk?